The island of Kos or Cos is an island in the Aegean part of the Dodecanese islands , by area (290 km ²), it is the third largest island in the archipelago after Rhodes and Karpathos. The island of Kos has nearly 30,000 resident population: it is the second most populous island of the Dodecanese after Rhodes. But Cos hosts during the summer season, from 600,000 to 700,000 tourists, including many British (around 220,000). The main tourist centers of the island is the town of Kos and its suburbs (Lambi, Psalidi), Kardamena and Kamari , but hotels and apartments have sprung up behind most beaches, those located along the north coast ( Tigkaki , Marmari , Mastihari ) being isolated from the hustle and bustle of the big resorts. The capital of Kos - and its main port - is also called Kos , is situated at the eastern end of the island and contains the majority of the population (18,000 inhabitants). 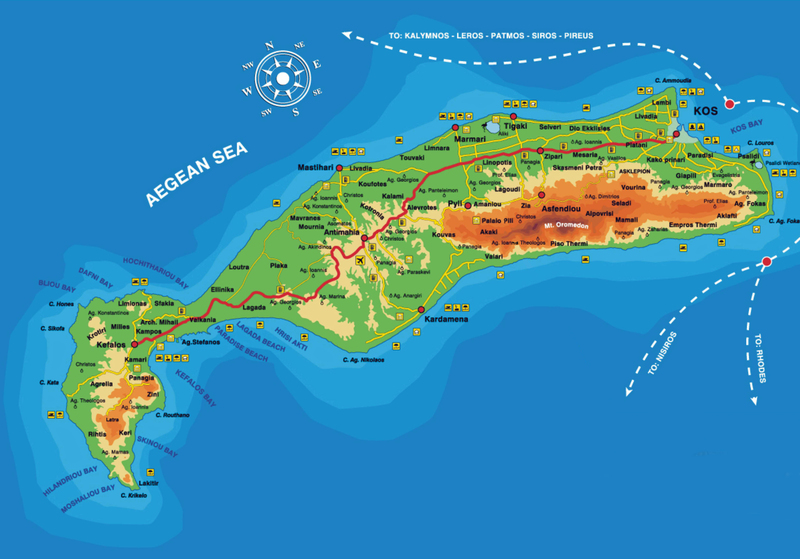 The main towns on the island of Kos are: Kardamena , Kefalos , Tigkaki , Antimahia (airport) Mastihari , Marmari and Pyli . The smaller ones are Zia , Zipari , Platani , Lagoudi and Asfendiou . 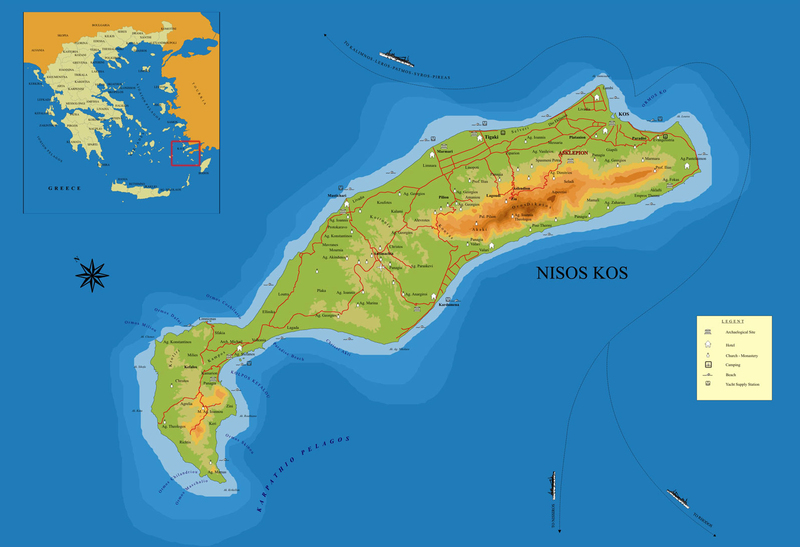 Kos is famous for being the home island of Hippocrates, the "Father of Medicine". The name of Kos (Greek Κως) come from the Greek name of the crab, which in antiquity was the emblem of coins of the island. Under the Roman Empire, Coos Kos called Cous or, in the Venetian or Genoese and of the Knights of St. John , Lango, under the Turkish occupation , Istankoy; under Italian rule , Coo. The island of Kos is located in the center of the Dodecanese , 119 km northwest of the city of Rhodes , and 370 km from Piraeus, the port of Athens. In contrast, Cos is only a short distance (4 km) of the peninsula of Bodrum (Bodrum Turkish Yarimadasi), and 23 km from the port of Bodrum , ancient Halicarnassus, Asia Minor (today "Today in Turkey). Datca peninsula, the ancient Knidos (Cnidus), also in Anatolia , is located 15 km south. Kos locks and the Gulf of Keramos or Kerme (Κεραμεικός κόλπος Greek, Turkish Gökova Korfezi) sandwiched between two peninsulas. Neighboring islands of Kos are Psérimos, 4 km north Kalymnos 12 km north Nisyros 12 km south Astypalaia (Stampalia) about 43 km to the west. The island of Kos offers very contrasting attractions, from numerous archaeological sites from different eras to a vibrant nightlife, through authentic villages in the very center of the island, and beautiful beaches, among the most beautiful in Greece. the Italian annexation in the first half of the twentieth century has left a beautiful urban architecture . the most picturesque beach is undoubtedly the beach of Agios Theologos on the west coast of the peninsula Kefalos , but access is a little less easy. However, you can find other beaches not far from the city of Kos, as crowded as the south: the south-east, the resort of Psalidi - where there is also a small marsh - and the north-east, the Lambi, a little later the picturesque beach of Empros , warmed by hot springs. Beaches, fringed with dunes, the northern coast - Tigkaki , Marmari and Mastihari - are a little quieter. As for the princes of the night, looking for a vibrant nightlife, they will find satisfaction in Kos itself, and for less demanding or more Anglophile in Kardamena , with bars where alcohol flows freely, restaurants and noisy nightclubs. 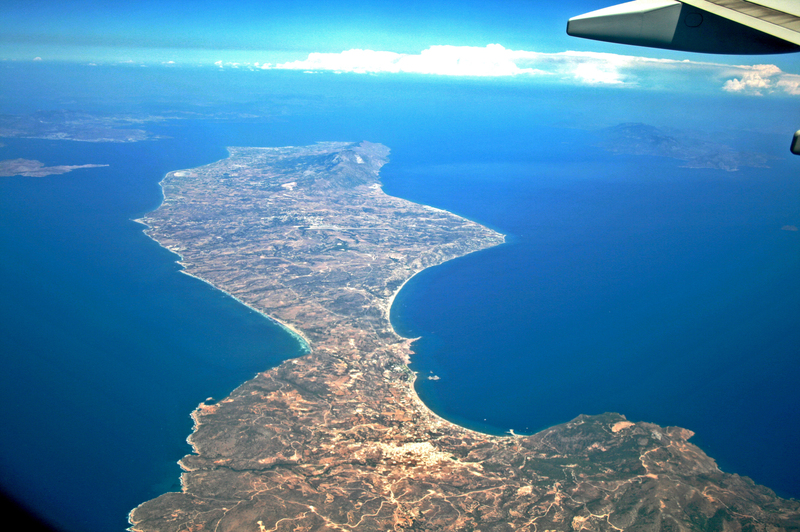 The island of Kos has an area of ​​290 km ² and stretches over a length of 42 km, with a width varying from 2 to 11 km only. The shape of Kos traditionally compare a dolphin whose eye is the city of Kos and the caudal fin, the peninsula Kefalos . The island peaks at Mount Dikeos to 843 m above sea level in the mountainous southeast of the island, covered with forests of pine and cypress, the center of the island is occupied by a plateau rather arid, while in the north of the mountains and the plateau lies a green and fertile agricultural plain. To the west, the peninsula of Kefalos culminates at Mount Latra at 426 m altitude in the south of the peninsula, the peninsula is separated from the rest of the island by an isthmus which has only 1.6 kilometers in its more narrow. The island of Kos is partly volcanic and is considered weakly active, because of the three springs of volcanic origin located there: to Empros , Agios Fokas and St. Irene (Agia Irini) (Piso Thermi ), the latter not being easily accessible. Kos was part of the same mountain with the neighboring islands of Kalymnos, Nisyros and other surrounding islands, after earthquakes and subsidence, these islands are now separated by a gap of 70 m.
The coast of Kos, 112 km in length, is relatively linear, but without significant indentations beautiful sandy coves, making the island’s success with tourists. Besides the inevitable Hippocrates , Kos Island was born, or hosted other celebrities: the bucolic poet Theocritus, a native of Sicily (319-250 BC), the great painter Apelles of Cos from the fourth century BC, a contemporary of Alexander the Great, he was the only one authorized to make the portrait; Philetas Cos, inventor of the alexandrine and tutor of Ptolemy II Philadelphus, king of Egypt. The economy of the island of Kos was traditionally oriented agriculture also cereals (maize and wheat), the island produces almonds, figs, olives, tomatoes and lettuce - another name Roman is "Cos lettuce." The vine is also cultivated, and a little citrus. 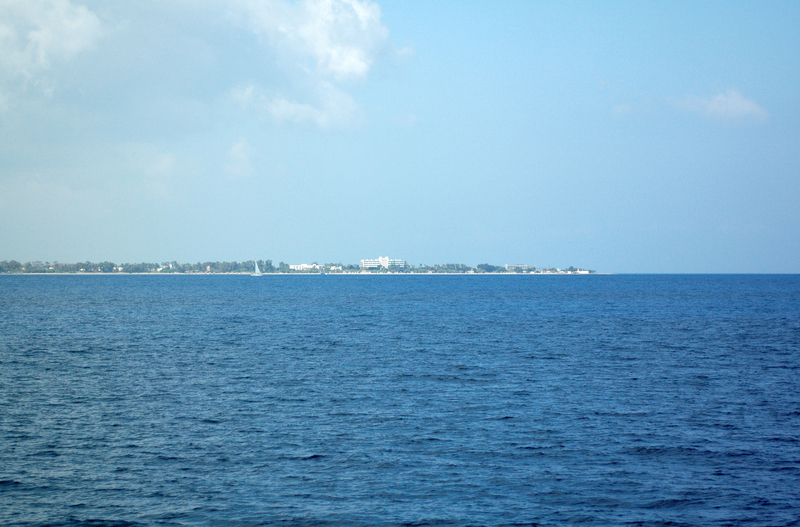 Tourism has now become the main activity which employs the majority of the inhabitants of the island. The airport "Hippocratis" Kos is 25 km south-west of the town of Kos , near the town of Antimahia . A public bus service connects the airport to downtown for a little over € 5 for the same journey by taxi costs about € 20. In addition to numerous charter flights, Kos is connected by regular flights of Aegean Airlines and Olympic Airways to Athens (2 to 3 flights per day) and Rhodes (2 to 3 flights per week Olympic Airways). Kos is one of the islands of the Dodecanese best served by several companies: ANEK Lines ( www.anek.gr ), Blue Star ( www.bluestarferries.com ), Hellenic Seaways ( www.hellenicseaways.gr ) et cetera. The port of Kos is a ferry stop between Rhodes and Piraeus, the port of Athens. Many different routes with stopovers in Kalymnos, Leros, Patmos, Lipsi, Amorgos, Naxos, Paros, Santorini and Syros. The crossing takes 10 hours to 13 hours. Kos is also served from Thessaloniki once a week. 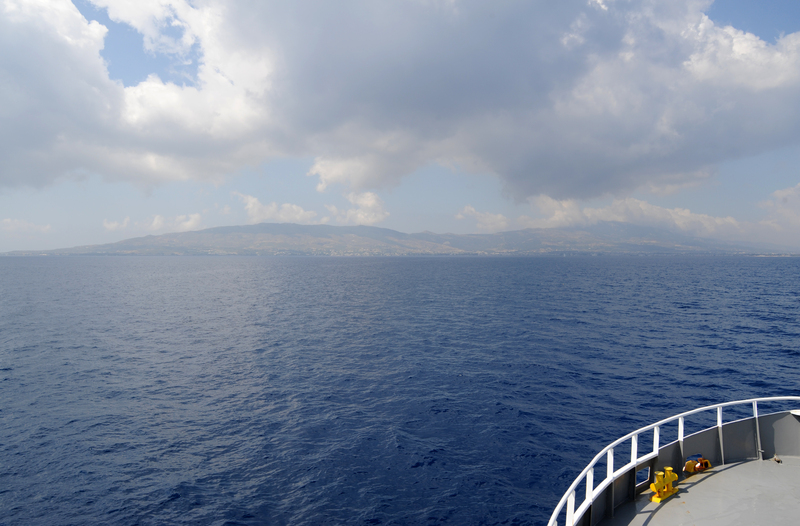 Incidentally, the ferry service Lesbos, Chios, Samos and Kalymnos. Liaison with stops in Rhodes Symi. Crossing time: 4 to 7 hours. Catamarans or hydrofoils to Rhodes, Symi, Kalymnos, Patmos and Samos. You can get a bus to almost anywhere on the island of Kos, routes and timetables on company KTEL ktelbus.com . The bus station is Vasileos Odos Georgiou, 100 m west of the agency of Olympic Airways (see map of the city of Kos ). Urban bus company DEAS covers Greater Kos, including Asclepieion (line 3), Platani and Agios Fokas (line 1). Most buses leave DEAS central bus stop, south of the port. Around Kos town can be visited on two-wheelers (many holiday scooters and bicycles Kanari Street, north of the port). The roads on the north coast, quite flat, are also accessible by bike.